Horizons Burleigh Beach Accommodation is situated close to all the Gold Coast’s most loved attractions, making it the ideal choice for your next family getaway. Only 50 metres from the beach, 10 minutes drive from Broadbeach and 15 minutes from Surfers Paradise, Horizon Holiday Apartments is perfect for those that want to experience all that the famous Coast with the Most has to offer. A short drive will take you into the heart of the Gold Coast hinterland, where you’ll find Heritage Listed National Parks teeming with ancient rainforest, hidden cave systems a diverse range of plants and native wildlife. Those that love action and adventure will be in the element with all of the region’s best theme parks within easy reach of our holiday apartments Burleigh. Brave the infamous Big Three rides at Dream World, meet your favourite Looney Tunes characters at Warner Brothers Movie World or swim with dolphins and sharks at Sea World. If you love to shop, you can spend whole days browsing the aisles at the huge Pacific Fair Shopping Centre, Harbour Town and the Oasis Shopping centre, all of which are just a short drive from our Burleigh Beach accommodation. Those in search of something unique, handmade and distinctly Australian, will love the Burleigh Heads Arts and Crafts Markets, which stretch out throughout the city every two weeks. Spend a relaxing morning browsing quirky jewellery, fashion, organic beauty products, art, vintage home wares and more. Back at our Burleigh Beach apartmentsafter a busy day shopping, you can sink into the spa for a long relaxing soak, or let the warm, comforting steam of our onsite sauna envelop you for half an hour or more. 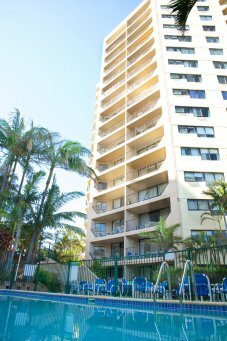 Book your stay at Horizon Holiday Apartments Burleigh Beach accommodation today!